Google has revamped its site for educators, creating a redesigned repository for all its educational tools and resources for teachers, schools, and students. The newest feature is News and Calendar, a listing of all events and deadlines for Google's education endeavors. 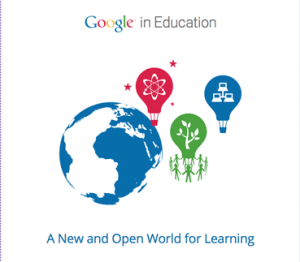 Google also created an online booklet called Google in Education: A New and Open World for Learning, which lists the company's initiatives and programs within the education realm, such as the Computer Science for High School program -- university-created workshops for local high school and middle school computer science teachers teachers. "We're hoping educators will use this year-round for ideas on how to enhance teaching and learning," said Google spokesperson Rachel Durfee. And for those who jumped on the Google+ bandwagon, a specific Google+ page for educators. The main Google in Education link offers much of the same content as before, but it's better organized and redesigned. The Teachers site leads to Google's many apps that can be used for teaching specific subjects, as well as design and collaboration tools. It's divided by K-12, higher education, and examples of how education systems across the country are using the tools. The site also offers a list of professional development links, including webinars, online workshops, and tutorials, which are primarily centered around Google products and services. The Student Showcases link lists student-created material, such as worldwide panoramas using Google Earth and Sketchup models of homes, towns, and robots. Schools and districts can find links to YouTube for Schools, which allows students to access YouTube EDU while blocking non-educational videos; App Engine, which hosts school web apps on Google's system; and Google Apps for Higher Education, a free suite of hosted email and collaboration application. For students, the site offers a list of awards and competitions -- think YouTube Space Lab and Google Science Fair; programs like Summer of Code, which offer stipends for student code developers and Computer Science Summer Institute for high schools seniors about to start college; tools like Google Apps for Students, like Google Docs and Gmail; and Google tools, which include every app and tool the mega-search site has created. Apps and software is one thing, but the company's hardware is also making its way into more schools. Last week, Google announced that three school districts in Iowa, Illinois and South Carolina are using only Google Chromebooks, the Web browser-based laptop, and that hundreds of schools across the country are deploying them in classrooms -- a total of 27,000 in the hands of students. "Students love the tablet. I am not going to hide that from you," said Diane Gilbert, an English teacher at Kelly Mill Middle School in Blythewood, S.C., who's taught with tablets in her classroom in a recent CNET article. "My goal is to have students publish their work--create and publish. The [Chromebook] is more alike to a laptop or a desktop in the ability to publish." Chromebooks are set up to use the Google Apps and other software found on Google's Education site.